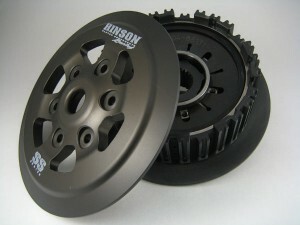 Hinson Clutch Components is proud to announce the next level of performance in High Performance Clutches, the SS Series Single Spring Conventional Inner Hub/Pressure Plate Kit. Precision Single Spring allows Pressure Plate to stay flat during disengagement minimizing clutch drag and heat build up -Eliminates the drag between the coil springs and inner hub/pressure plate creating a smoother more positive lever action and clutch engagement -Improves clutch performance and life -Precision machined from billet T-6 aircraft quality aluminum to aerospace tolerances, and Akadized for five times the wear resistance to stock* (*with proper maintenance) -Allows clutch assembly to spin more true creating less heat when clutch is disengaged -Simple installation -No special tools needed -When used with Hinson Clutch Components clutch basket helps eliminate clutch chatter Hinson Clutch Components is the premier manufacturer of high performance clutches & components, providing to all major factory race teams, including Team Red Bull Honda, Team Monster Kawasaki, Team Yagermeister KTM, Team Rockstar Makita Suzuki, & Team JGR Yamaha. Through this commitment they are proud to have won over 189, National & World, ATV, Supercross, Motocross, Supermoto and Off-Road Championships.